Barça started this game with only one goal: to continue their quest for an unbeaten league season. Valverde’s men were unable to deliver this in an unbelievable game against Levante in Valencia. A Coutinho hat trick and a Suárez penalty were not enough as Levante scored five at home to defeat the blaugranas. Before kick-off the Levante players gave Barça a guard of honour. The game started with Andrés Iniesta, in his final away game, getting on the ball and whipping a dangerous cross in within the opening two minutes. Dembélé and Coutinho were also prominent early on showing a willingness to take the ball and run at defenders. The Brazilian was fouled on the edge of the box and, in Messi’s absence, Suárez smashed it against the wall. Against the run of play, Levante scored the opener with their first attack of the game thanks to Morales’ superb run into the box which ended with him flashing the ball to Boateng who finished at the near post (1-0, 9th minute). Two minutes later, Bardhi received the ball following a Boateng mishit and he rattled the bar with Ter Stegen beaten. Barça looked were having some nervous moments in defence. A steadying spell of Barça possession was broken up as Morales broke down the right and a good Alba block put it out for a corner. Soon after, Dembélé went close following some good build-up play as Coutinho turned quickly and fed Suárez, who found the Frenchman. His shot was deflected wide for a corner. Unfortunately, Vermaelen went down with a muscle injury and had to go off midway through the first half. With Piqué getting ready to come pn, a second goal arrived in the 31st minute. Boateng received the ball, went past Ter Stegen, held off Semedo, and stroked it into the net. Piqué made an instant impact by winning the ball and charging forward. He fed the Brazilian, who shimmied to his right and smashed a ball into the top right corner with Oier stranded (2-1, 38th minute). Barça were back in the game before the end of the half. In the first move of the second 45 minutes, Bardhi curled in a beautiful goal. He gave Ter Stegen no chance as Levante punished a loss of possession from Barça leaving Valverde’s side with a mountain to climb (3-1, 46th minute). The task got a lot harder soon after. Boateng received a killer pass from the full-back Luna and the Levante player scored his third goal with a cool finish when left alone on the right following another fast break (4-1, 50th minute). The unbeaten run looked over when Bardhi got his second of the night as Levante moved 5-1 up with a fantastic team move (5-1, 56th minute). The crazy game continued as Coutinho made the most of a rebound from a Dembélé shot to rifle into the net and give the blaugranas a glimmer of hope of an unlikely comeback. The Brazilian gave his team even more hope when he picked up a lovely pass inside from Busquets and hit another shot from long-range which went in aided by a deflection (5-3, 63 minutes). Barça had raised their game led by the irrepressible Coutinho. Boateng then fouled Busquets in the box as a corner was whipped in. Luis Suárez took the spot kick and produced an emphatic finish to score the game’s ninth goal and get his team back to within a goal of a stunning comeback (5-4, 70th minute). The goal proved hard to come by in an open 20 minutes. Both sides took turns to attack with the midfield frequently bypassed. Suárez and Coutinho tried their luck for Barça and Rochina had a good chance for Levante. 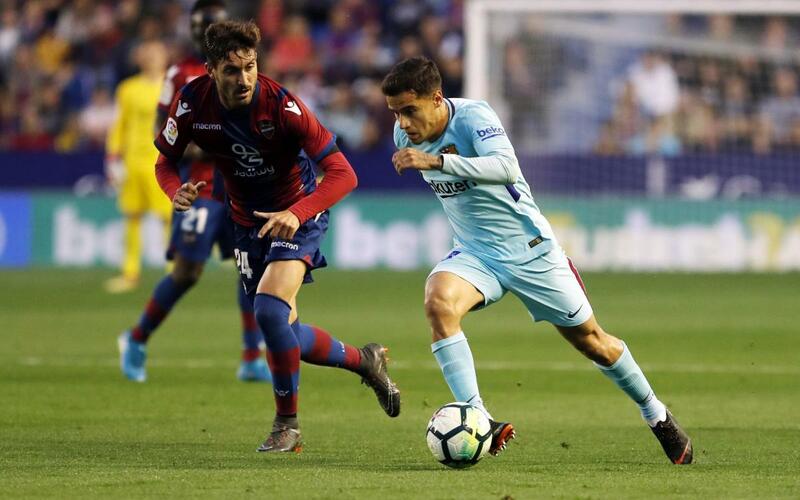 At the end of a frantic game, the blaugranas were unable to prolong their unbeaten run on a night in which Levante proved to be inspired opponents. The record stands at 43 games, with 36 this season as well as seven from the end of last season. Valverde’s side will now turn their attention to the final league game of the season against Real Sociedad on Sunday 20 May.